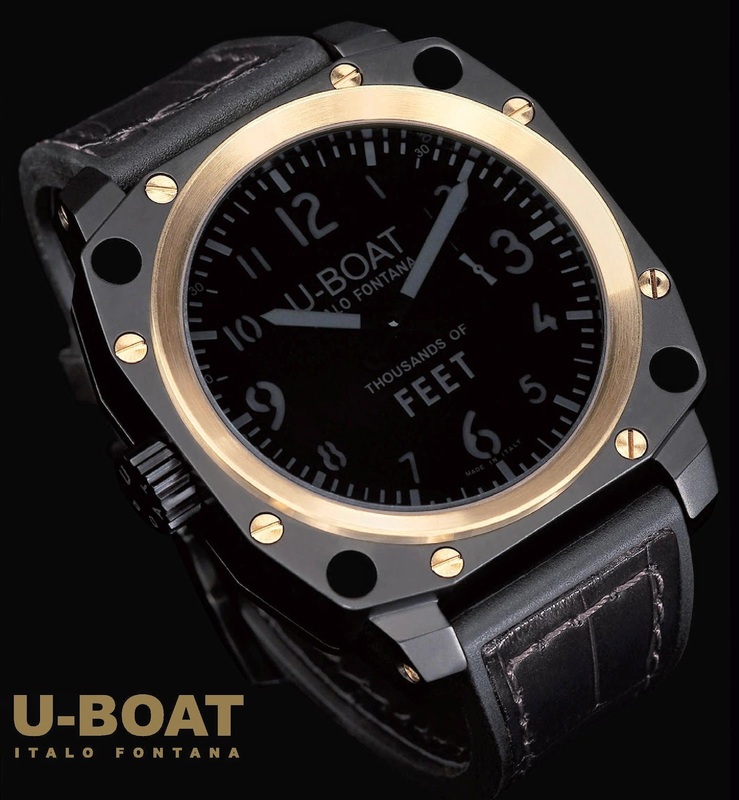 The THOUSANDS OF FEET GOLD SCREWS from U Boat is available in two case sizes: 43 mm & 50 mm. The Steel PVD case is highlighted with 18 K yellow gold bezel, with 4 yellow gold screws securing the strap to the case and finally 8 yellow gold screws which lock up the back case from the upper side. Its black dial with luminous white hands and markers is made with two superimposed dials, one white treated with super-luminova and the other one cut, treated with composed opaque black pigments. The 50 mm version is equipped with the UNITAS 6497 mechanical hand winding and 43 mm version houses an automatic mechanical movement, which is personalized to U Boat specifications for stem to be positioned at 9 o’clock. For 50 mm diameter, hypoallergenic and non-toxic rubber with alligator inset, square scales, dark brown. Width: 26/20 mm. For 43 mm diameter, black alligator, square scales, 3 cuts out. Width: 20/20 mm. Handmade and hand finished.